Dunham announced she was behind the sweatshirt design while denouncing the fact it was modeled on "thin white women." Clothing retailer Revolve removed one of its sweatshirt designs from the website on Thursday due to backlash online. People were troubled by the design, which read: "Being fat is not beautiful it's an excuse." They accused the company of body-shaming. Model Tess Holliday called Revolve "a mess" on Twitter for conceiving of and promoting a sweatshirt with such a message. 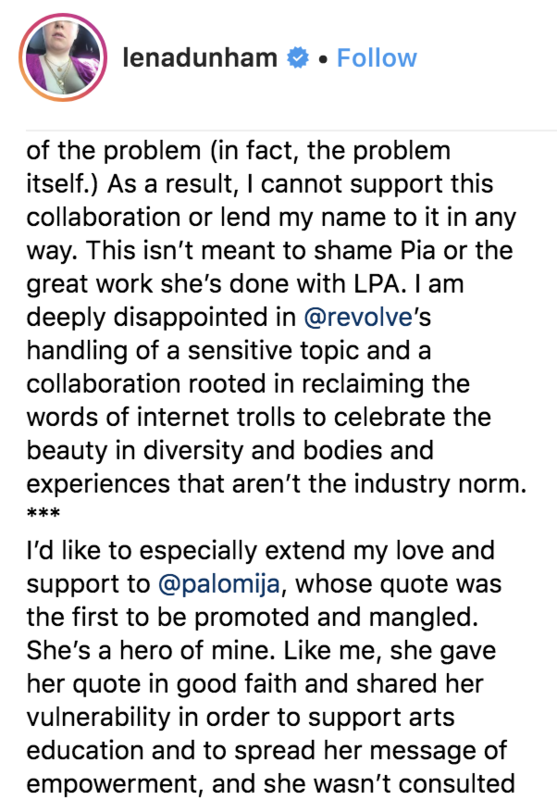 LPA, the clothing brand behind the design, was forced to respond to the criticisms with an Instagram post. The brand said it knew the "quotes within the collaboration were shocking, which was entirely the point." The brand apologized for a "lack of communication that lead [sic] to how the collection was portrayed on Revolve.com and the premature release of the e-commerce imagery." Then, on Thursday, Lena Dunham entered the controversy. With her own Instagram post, she announced that she was the one who helped come up with the Revolve x LPA sweatshirt slogans. She said her intention was to empower women who've experienced "internet trolling and abuse" by giving them the opportunity to wear their abuse on a sweatshirt. However, she said Revolve got the point of the sweatshirts all wrong by modeling them on "on thin white women." 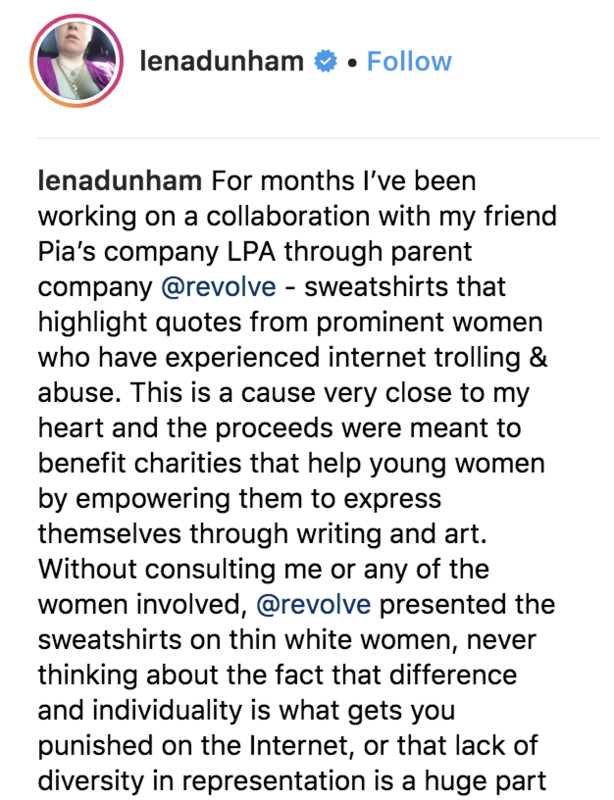 "Without consulting me or any of the women involved, @revolve presented the sweatshirts on thin white women, never thinking about the fact that difference and individuality is what gets you punished on the Internet, or that lack of diversity in representation is a huge part of the problem (in fact, the problem itself)," she wrote. Dunham said her intention for speaking out, and explaining her involvement with the debacle, was to make the statement that she "cannot support this collaboration or lend [her] name to it in any way." "My only goal on this planet is to empower women through art and dialogue," she said. "I’m grateful to every woman who shared a quote and so disappointed that our words were not honored." Dunham said as a result of the mishap she plans to make a "donation to the charity of every woman’s choice who was wronged with me" and asked Revolve to make a similar donation with her. BuzzFeed News has reached out to Dunham to learn more. In the meantime, people are reacting to Dunham's revelation. And, of course, piling on more criticism and questions for Dunham about her initial clothing design idea.